What makes a VIQUA UV water disinfection system so great? What makes it different from many of its competitors? And why should you buy a system from VIQUA? Let’s be honest. There are tons of different UV water treatment systems available in Thailand and many of them are cheaper than a VIQUA filter. Sho why spend more money on a VIQUA system? This is not a post to compare different water treatment technologies or a post to convince you that UV-technology is better than Reverse Osmosis. If you want to know why UV is the better option, then check out this article. So, back to UV-systems. Why should you choose a UV Water Disinfection System from VIQUA? 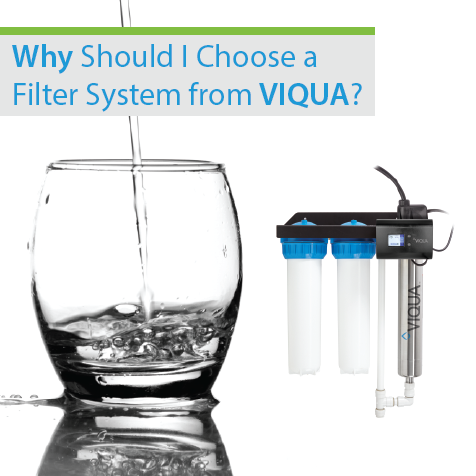 To help you understand the differences between a VIQUA filter and many of its competitors, we are going to look at a few factors that matters when you are choosing the best system for your home. All UV-lamps are not equal. If the UV-lamp is not meeting required standards, your water might not receive the correct UV-dose needed to disinfect the water, and your system would be useless. Make sure that the UV system you buy is actually doing its job and that it meets international requirements for UV Systems. Why would you take the risk of putting you and your family in danger of drinking contaminated water? One of the most recognized marks in water treatment is the NSF mark. NSF International is an independent certification organization responsible for developing the standards to which water treatment products are tested such as NSF 55 for ultraviolet (UV) disinfection devices. When a UV system is NSF certified, it means the UV system complies with the strict standards and procedures imposed by NSF including extensive product testing and material analyses. As the manufacturer, VIQUA is also subjected to unannounced plant inspections and regular re-testing of our products to maintain the NSF certification. It is not a one-time event but an ongoing review process. If your house has a water pump installed, make sure your water filter can handle the water pressure. Many common filter systems available does not have any information about max pressure and are sometimes built with low-quality thin plastic hoses and pipes. What happens if it starts to leak when you are not home? A VIQUA filter has a max pressure rate of 8.6 bar or 124 psi which is almost twice as much as some common filter systems available locally. Many systems has a flow rate of only around 2 litres/minute which means they can not be used with your existing kitchen tap which usually has a flow rate of 6-8 litres/minute. This means that you have to drill a hole and install a separate drinking water tap in your nice kitchen countertop. Also, many so called “Whole Home” systems available locally (1 filter that filters all incoming water to your house, usually installed right after your water pump) does not have high flow rate enough to be able to provide a 2-3 bedroom home with safe water. Why is this dangerous? When the flow rate is too high for the UV-lamp to keep up, the water will not get enough UV-dose and your water is no longer considered safe to drink. A VIQUA Multi Point System (usually installed under your sink) has a maximum rating of 7-13 litres per minute and be connected to your existing kitchen tap without affecting the water flow. A VIQUA Whole Home System has a maximum rating of 40-70 litres/minute which is enough to provide the whole house with safe drinking water straight from any tap in the house. Bored with facts about UV-Systems already? OK, let’s stop there then. These are just 3 factors that you should take into consideration when choosing your system. There are many more. How is the quality of the parts used in the system? How long is the warranty? Are replacement parts easily available? Is there an easy to use control panel that warns you if problem occurs or when it is time to change the UV-lamp? Do not take any chances when it comes to water disinfection. After all, it is about you and your family’s health and well-being.